Priced at Rs 12.99 lakh (ex-showroom), the three-door off-roader will be sold in the country in a phased manner. Force India on Tuesday launched powerful off-roader Gurkha Xtreme. Gurkha Xtreme comes with the same drivetrain that powered the podium finishers at the Indian edition of Rainforest Challenge 2014, 2015 and 2016, claims the company. Priced at Rs 12.99 lakh (ex-showroom), the three-door off-roader will be sold in the country in a phased manner. The Gurkha Xtreme boasts "excellent" off-roading capabilities. The company says it is the only vehicle in its class with mechanically actuated differential locks on both axles. Its high strength C-in-C chassis is designed to take high bending and torsional loads. The company is offering coil spring suspension -- for the first time in this category -- on four wheels. 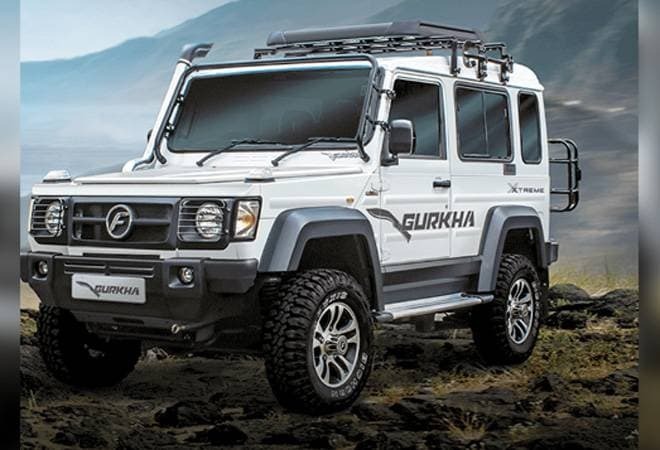 "The Gurkha breathes through a snorkel mounted at roof height of the vehicle that ensures ample supply of clean air to the engine ensuring superior combustion and lower strain on the air cleaning system," claims the company. The snorkel also gives Gurkha a high water wading ability of up to 550 mm. The Gurkha has a ground clearance of 210 mm. Critical areas like the engine underbelly, fuel tank, propeller shaft joints have a protective shield, which helps in preventing damage during off-roading. The Gurkha's 44 degree Approach Angle and 40 degree Angle of Departure (w/o footstep) enable it to negotiate steep gradients and tackle ditches easily. Available with seating of capacity of six people, including the driver, the Gurkha Xtreme comes with 18 months/unlimited km warranty. The Gurkha is powered by the Mercedes OM 611 derived, 140bhp/321 Nm common rail direct injection engine with dual mass flywheel, mated with the Mercedes derived G-32, 5-speed gearbox. It boasts of maximum output up to 140 hp at 38 rpm, while maximum torque of 321 Nm at 1600-2400 rpm.